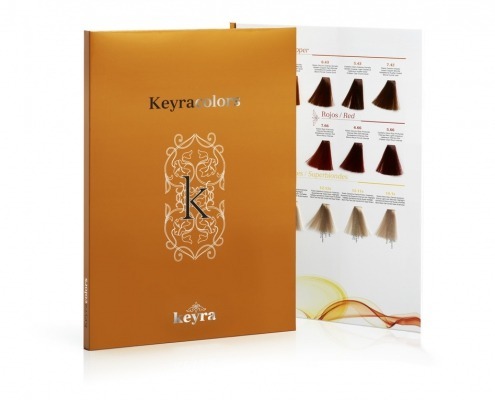 Keyracolors is a varied and optimised range of 72 shades chosen from among the most on-trend colours. The range is distinguished by its vibrant, shiny and lasting effect and is formulated with keratin to deliver a four-way result: 100% coverage guaranteed, shine, nutrition and softness. Natural Super Covering, Natural Bases, Ash, Black, Golden, Chocolate, Mahogany, Copper and Violet. Mix in a 1:1 ratio [100 ml cream + 100 ml 20 or 30 Vol. KeyraOx hydrogen peroxide]. For super-lighteners mix in a 1:2 ratio [100 ml cream + 200 ml 40 Vol. KeyraOx hydrogen peroxide]. Consider the percentage of grey hair or shades to lighten in both cases. Leave in maximum 30 minutes; 35 mins for red and copper colours and 45 mins for super-lighteners. The product can be spread through the hair to the tips in the last 10 minutes at the stylist’s discretion.